Originally published May 2015, updated September 2017. As you can tell from the title of this post, kale slaw is on the menu today. But it’s not just any kale salad. 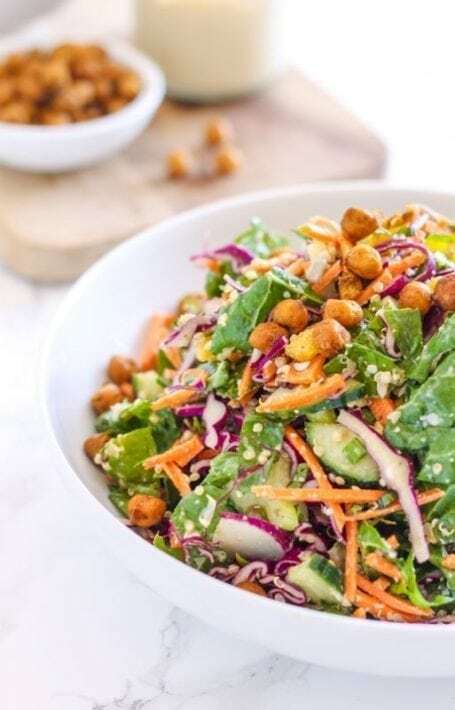 After Monday’s 20 spring salad recipes, I wanted to bring you a brand new one that will totally knock your socks off – even if you’ve never really been into the whole kale slaw/salad thing in the past. I’ll be straight-up honest with you: kale has never really made my stomach very happy. Sure it can taste great at the time, and sure I really want to eat lots of it because nutritionally speaking, kale is a super source of calcium and vitamin C. But there’s always been something about these leafy greens in particular that my digestive system has trouble handling. Sound familiar? I’m told this isn’t uncommon, and because I really do love kale, figured I had to be doing something wrong. As it turns out, I was! There are two secrets to totally nailing this one: Massaging and the dressing. Let’s talk about massaging first. Since kale leaves are so tough in comparison to other greens like spinach, romaine lettuce, and even Swiss chard, the process of digestion takes a little longer. A 1-cup serving of chopped raw kale has 2.4 grams of fiber, both soluble and insoluble, and it’s the insoluble kind that our bodies can’t break down. When we cook it, this helps to break down the fiber content so our insides don’t have to, and therefore steaming kale before eating it can make it more tolerable for a lot of people – myself included. However, when eaten raw, your digestive system has a bigger job to do. As I’m sure you’ve heard before, digestion starts in the mouth. We’re told we should chew our food lots before swallowing, and I don’t know about you but I’m certainly guilty of practically inhaling meals when my appetite is ravenous enough. But in addition to chewing a lot, massaging kale thoroughly – I mean really getting your hands in there, like you’re kneading play dough – also helps to break down the fiber. Previously, I’d been just removing the thick stems and tossing my bits of kale with other salad ingredients, which (I suspect) was causing the tummy problems. Massaging is the new black in my house, and that’s where the next step comes in – the dressing. I’m sure you’ve heard of ingredients like lemon juice being good tenderizers for meat, and the whole idea of a tenderizer is to soften muscle fibres. The same sort of applies to kale, only it doesn’t have muscle fibres – it’s just got fibre! Massaging kale with an acidic liquids such as vinegar, lemon juice, or other juice from a citrus fruit helps to soften the leaves, and like chewing lots or cooking, this makes the kale easier to eat. 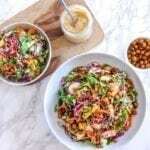 There are 2 such ingredients in this dressing – rice vinegar and lemon juice. Guys, this might just be one of the best darn dressings I’ve ever made. It was inspired by the vegan oil-free miso tahini dressing that Whole Foods sells, and because it costs $6.99/bottle, I wanted to see if I could re-create it myself. The ingredients were right on the label, so I bought them myself and made an enormous batch by simply adding them in, one tablespoon at a time, constantly taste testing against the store-bought version. The result was mind-blowingly delicious and I almost wanted to run over to a neighbour’s house and go, “Taste this!! TASTE THIS!! !” I promise, you don’t be disappointed. 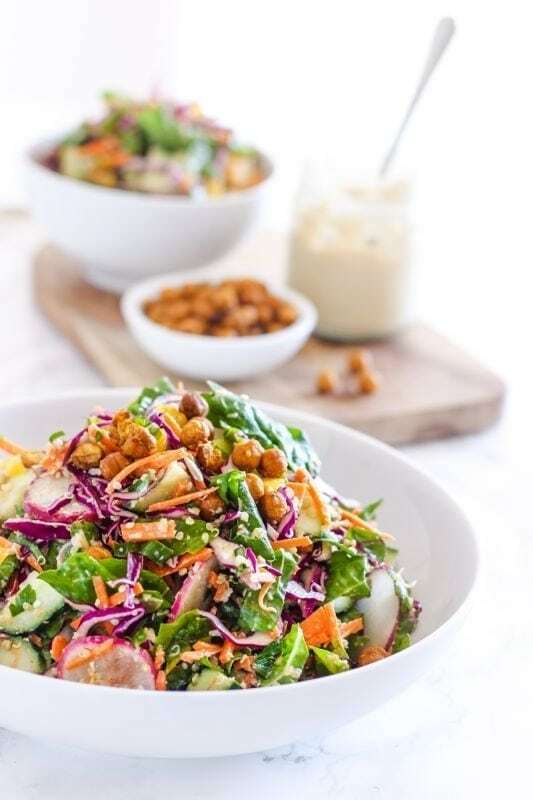 When making this Rainbow Kale Slaw with Miso Tahini Dressing, I started by massaging the chopped kale with apple cider vinegar, then let it sit for a few minutes while preparing the other veggies. I added a bit of the miso tahini dressing to the kale and cabbage, massaged some more, tossed in the remaining ingredients, then gave everything one final stir. The result was a beautiful, colourful bowl of vibrant plant-based goodness that I’ve eaten 3 days in a row and still can’t get enough. I hope you love this one as much as I do! 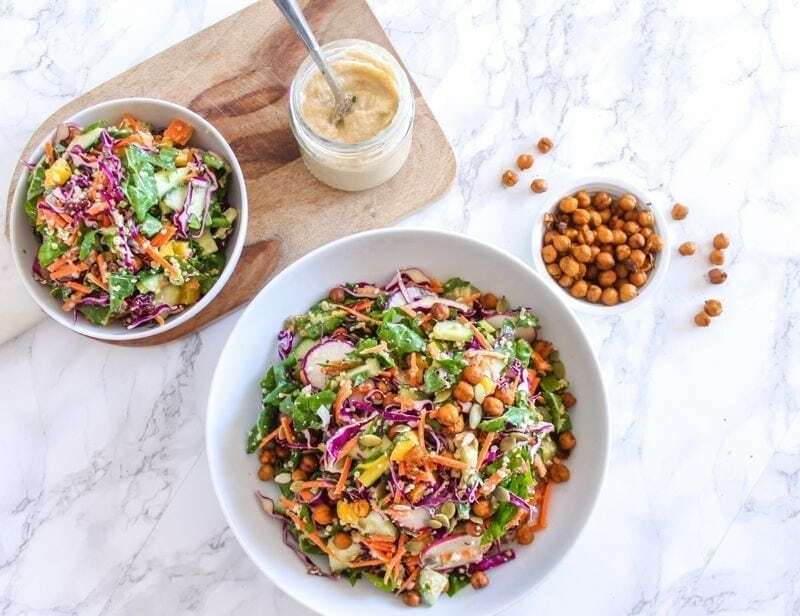 All sorts of textures and flavours come together in this Rainbow Kale Slaw, sure to please your tastebuds while leaving your body feeling amazing and energized, too. As the dressing cools in the fridge, it will thicken up. In order to thin it back to dressing consistency, store it in a container bigger than you think you need and simply add some water. 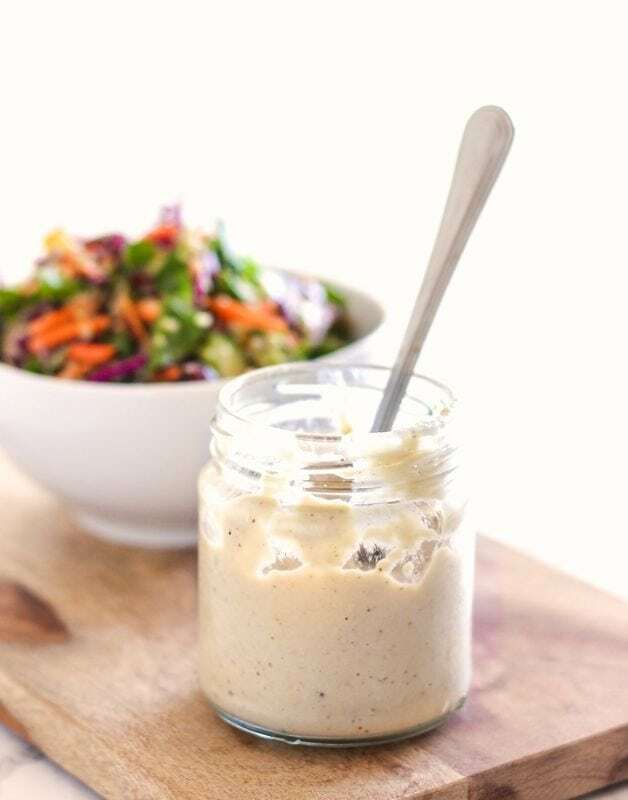 Shake it up and voila – you have dressing again! When making the crispy chickpeas, be sure to check them every 10 minutes or so – for even cooking, and because ovens are different and yours might cook faster than mine! If you’re a kale salad fan, what are your favourite ingredient combos? What kind of kale do you like? I’m a fan of the lacinato/dinosaur kale because the leaves are a bit thinner, but my grocery store only seems to have the curly kind right now! Do you have any recipe requests for upcoming weeks? Any favourites you want cleaned up? I’m taking suggestions! Ange. I always learn ALL THE THINGS over here. Firstly, I am going to massage my kale from here on out. Just from reading the ingredients for the dressing I know I’m gonna like it. I didn’t know massaging aided in digestion either. Maybe it is time to try raw kale again! Crazy, hey?! Still, I’m careful about the quantities of raw greens I eat because of the oxalates and my whole spinach sensitivity thing, but I’m thrilled to know I don’t need to totally avoid raw kale any more. I’d be interested to hear if it has the same effect on you! Love the colours in that salad ! Can’t wait to try it. 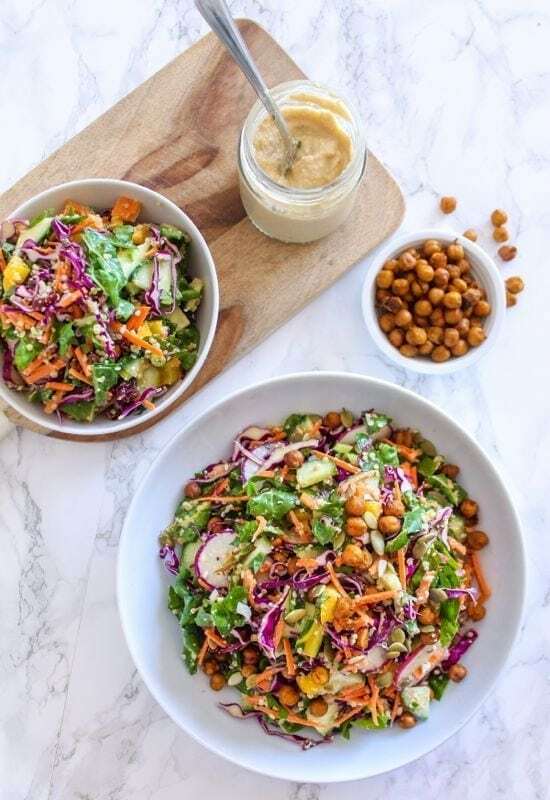 With the warmer weather peeking, I’d be most interested with recipes that don’t involve turning the oven on… So your 20 salad recipes that perfectly timed for me ! More plant-based / raw recipes maybe?